In the world of baseball memorabilia collecting, items related to members of the Baseball Hall of Fame always fetch a premium. Heritage Auction Galleries of Dallas is currently offering a wide array of Cooperstown-worthy treasures as part of their April “Signature Sports Memorabilia” auction. One of the Heritage offerings was a rare 1924 letter written by Chicago Cub legend Joe Tinker, of Tinker-to-Evers-to-Chance fame. Another gem was a compelling letter written in 1909 by Pittsburg Pirate manager Fred Clarke to National League President Harry Pulliam supporting an umpire’s call in a game protested by the St. Louis Cardinals. Both Tinker and Clarke are members of the Baseball Hall of Fame in Cooperstown and documents in the files of the National Baseball Library suggest that the letters they once wrote may belong in the Hall of Fame as well. This afternoon, Heritage withdrew both items from the sale. Forty years after the Seymours worked with the collection, the Hall finally received funding in 2004 from the Yawkey Foundation to catalogue and conserve the collection. The grant facilitated the creation of a detailed “finding aid” available to researchers and fans interested in Herrmann’s treasure-trove of baseball history. The 40,000-plus documents are now carefully arranged in 144 boxes of archival file folders which identify documents by both name and subject. To date, close to half of the collection has also been microfilmed. Of particular interest is one of the Hall of Fame’s file folders designated “Joe Tinker-Spring Training-1920-1926” and another folder marked, “Protested Games Pittsburgh-St. Louis July 24, 1909.” It appears that the Heritage Auction letters may have originated from these files. Heritage describes the Tinker document in its catalogue as “…a letter to Herrmann to provide updates on the construction of a baseball park in Orlando, Florida which would become the Cincinnati Reds’ new spring training home.” In the letter written on Tinker’s company stationary, Tinker asks Herrmann for a new lawn mower. The Hall of Fame’s Herrmann/Tinker file found in folder 40 of box 28 includes over 20 letters written by Tinker to Herrmann from 1920 to 1926. 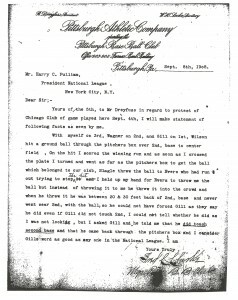 The Heritage letter is dated Sept. 3, 1924 and, like the Hall of Fame letters, contains content related to spring training. The Herrmann Papers archive also includes correspondence related to all protested games in the National League from 1902-1926. Hermann and his fellow owners had the final say in regards to disputed games, so Herrmann as chairman of the National Commission retained the protest files in his Cincinnati office. Lot 81842 in Heritage’s sale was a letter written by Fred Clarke regarding a game played on June 24, 1909. The game played that day was protested by the St. Louis team and Herrmann’s office ultimately ended up with all of the protest documents needed to render the decision. Box 44 of the Hall of Fame’s Herrmann Papers archive includes an entire file dedicated to this specific protested game. File folder 8 includes original correspondence between Herrmann and fellow owners. as well as the transcript of their decision. The transcript incorporates a copy of Fred Clarke’s letter to Harry Pulliam as well as other affidavits including one written by Hall-of-Famer Roger Bresnahan. The original copies of the statements used in the transcript appear to be missing. The “Protested Games” section of the Herrmann archive includes many other original statements and letters written by Fred Clarke to National League Presidents concerning other disputed contests. So how did letters regarding official baseball business written to “Garry” Herrmann and league presidents make their way to Dallas in a big-time Texas baseball auction? The answers may lie in FBI files regarding an investigation into thefts that occurred in 1988 at the National Baseball Library in Cooperstown. A former Hall of Fame official confirmed that the FBI conducted an investigation into those thefts but the outcome of that investigation is not known. The Hall of Fame has been subjected to thefts over its 71-year history. In the 1970s several baseballs autographed by American presidents that were donated by the family of pitcher Walter Johnson were stolen from the Hall of Fame’s museum, and in 1983 an employee of MLB’s Commissioner’s office was found to have sold items on loan from the Hall to a Long Island memorabilia dealer. The FBI returned the presidential baseballs in 2001 and several World Series programs that were sold in 1983 by Bowie Kuhn’s aide, Joe Reichler, were replaced. Nevertheless, each of these instances of theft contributed to negative publicity for the institution, which relies solely on donations to enrich its collections. An investigation by haulsofshame.com indicates that the thefts from the Hall of Fame’s Herrmann Papers may extend well beyond the current Heritage Auction. An examination of the other protested games files indicates that additional Fred Clarke letters may be missing from the Hall of Fame files. A May 1, 1909 Fred Clarke protest letter sold as lot 114 in Mastro Fine Sports’ 1998 auction and an Oct. 12, 1912 Clarke protest letter sold for $3,162 at Sotheby’s in the 1999 auction of the Barry Halper Collection. Sotheby’s also sold affidavits signed by Joe Tinker and his teammates for a protested game on Sept. 4, 1908. It appears that the affidavits of Tinker and the other Cubs may also be missing from the Hall of Fame’s Herrmann archive. Heritage Auction Galleries was contacted by haulsofshame.com on April 20th in regard to the two suspect letters and Heritage was also presented with copies of similar documents that are part of the Hall of Fame’s collection. Heritage withdrew both of the items from the sale this afternoon and a notice on the Heritage website indicated that all bids already placed on the items were “cancelled.” Although Heritage responded to haulsofshame.com inquiries, the auction house did not release a formal statement regarding either the letters or their withdrawal. The Baseball Hall of Fame responded to inquiries but did not release any formal statement as of the time this story was published. Sources indicate the Hall of Fame is conducting their own investigation into the matter and that, independently, the FBI has been presented with additional information regarding many other items believed to have originated from the August Herrmann papers archive.